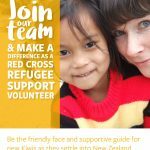 As a Refugee Support Volunteer, you will be a key participant in the successful resettlement of former refugees. This is a wonderful opportunity for you to work in a team, have fun, learn about diverse cultures and gain the satisfaction of doing something worthwhile! Full training is provided. Next training course: starts 4th August. ‘Ramsay to Renoir’ is a fundraiser for Life Linc Nelson; a charitable organisation that provides very low cost professional counselling to couples and individuals within Nelson /Tasman.Using live models wearing historically accurate recreations of garments from famous paintings. Historian Leimomi Oakes will explore the intersection between art and fashion. Whanake Youth Board invites you to discover what we have achieved, what we are doing and what we wish to do. Following our presentation join us for our AGM.